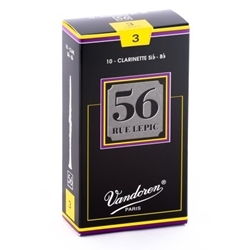 56 Rue Lepic is the address where Vandoren reeds were first produced and as such is widely regarded as the home of reed innovation. Designed from thicker cane, the 56 emits a rich, centered and extremely pure sound while providing maximum stability in all registers. Its quick response ensures precision in the most difficult passages without sacrificing the extraordinary round and warm sound.